I didn’t mention in the video that I also recorded a lot of videos for A Taste of Japan. There should be four videos to come, though probably not until after we’ve moved to Canada. I have a lot more other videos to do before I get to them. Hard to believe it’s only a month until Canada. I definitely need to get a job at a travel agency so we can travel to Japan often. A day late, but that’s better than nothing. I guess this is my birthday update! February is about to end, and it’s been a very busy week. I went on a short holiday to a beautiful seaside hotel and hot spring. Did a bit on videos, with another coming tonight. But how will February end in stats? It may be the best month ever! I only made progress on one book, Redemption Ark by Alastair Reynolds. I’m now at 16%. Still at 43% for Keepers of Water. Again, nothing to report here until this spring. No time at the moment. I did a bit with Esperanto, but I didn’t advance in level. I’ll be working more on this this week. I keep thinking about cars. The Mazda3 is looking good, though I’d have to test drive it. Also, we have to decide which school our daughter will go to. We have a couple choices, but I don’t know if she could make it into the Cogito program. If so, then she could go to one of the best schools in the province. If not, she’ll go to an above average school nearby. I did only one video, but it was about something that’s kind of difficult, saying goodbye. I have to say that to several students. Here’s the post I wrote about it. I’ve been thinking a lot about what’s going to happen after moving to Canada. I have a lot of plans, not only for the blog, but also for work, YouTube, and more. Also, if I’m lucky, I’ll have a total of 70,000 views by the end of the day tomorrow. More videos. Definitely focusing a lot on that. Also, more studying Esperanto. And I need to get a lot done with the whole move. And of course, more quality blog posts! How was your week and weekend? Let me know in the comments below. It’s my birthday. I remember when my parents were my age. Now I’m that age. Weird. But you know what? I don’t care. Age is just a number, and I feel totally different than my age. People are expected to be or act their age. I may act it in some ways, but I’ll still do fun things younger people do. I’m not going to be an age, I’m going to be me. Besides, with my daughter being only four, I have to be young at heart. In other topics, the trip this weekend was amazing. The hotel was amazing. The hot springs were amazing the view was amazing. I have a lot of pictures, but also around four videos to add to A Taste of Japan. I’ll try focus on those videos before we go to Canada, but no way I can finish them all. It’s about thirty-three videos to make. Wish I could take that holiday over again. My weekly report is delayed, and will be done tonight, as well as the weekly science video, and another post with a video I recorded this morning. Lots to see! With the state of science education and anti-science sentiment today, there are some champions who are fighting against the evils of climate change denial, anti-vaccination groups, contrail conspiracy theorists, and advocates of creation being taught in science. These heroes I would like to call The Champions for Science Education. I’d like to introduce you to these amazing people. 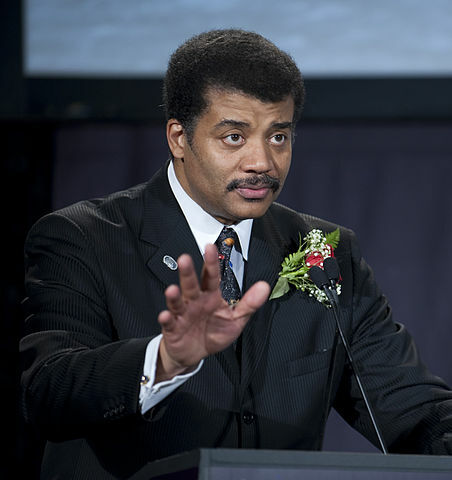 This American astrophysicist has been a strong advocate for science for quite some time. He’s amazing. He is my hero. He would be the leader of the group. He has incredible super science teaching abilities, and has a devastating anti-science annihilation technique. Recently, he shot down a flat-earther, who just happens to be a rapper by the name of B.o.B. He currently has a podcast called Star Talk, and was the host of the revival of Cosmos, originally hosted by Carl Sagan. Also known as Bill Nye the Science Guy, this educator, scientist, engineer, TV host, and actor is another champion of science education. He’s willing to go the distance to fight against the evil anti-science villains, such as Ken Ham, who he debated at the Creation Museum. He became famous while hosting Bill Nye the Science Guy, and is now the Executive Director of the Planetary Society, which counts Carl Sagan as a co-founder. He’s even taken an astronomy class taught by Sagan. He’s a fighter for awareness of climate change and space science, among others. He’s a real warrior for the cause of science education. Known as the Bad Astronomer, he’s actually not a bad astronomer. He fights against bad astronomy. He’s one amazing warrior, battling against the evils of climate change denial, anti-vaccination, and anything anti-science in general. He takes on pseudoscience, and has tackled many conspiracy theories related to astronomy, and especially the moon landing hoax. He’s written Bad Astronomy and Death from the Skies, and even worked on the Hubble Space Telescope. He was President of JREF, an organisation dedicated to educating the public on finding the truth, rather than accepting everything they’re told. He is a great addition to the group. Dr. David Suzuki is a retired university professor, TV host, and environmentalist who is well-known for his TV show The Nature of Things. He’s a biologist who worked in the genetics department of the University of British Columbia in Vancouver. And he is now battling the evils of the enemies of Mother Nature. Fighting climate change is his passion, and he’s always teaching people about the dangers of what could happen if we don’t stop this destructive change. He’s probably the most famous scientist in Canada, and his reputation helps him promote science education. Also known as SciBabe, she’s a science blogger, chemist, and public speaker. She’s also dedicated her life to battle the evils of anti-science. She takes on pretty much anything, always working to educate the public on science myths. She’s a master at debunking poor science. Her biggest arch-nemesis is the Vani Hari, also known as Food Babe. She wants everyone to know how dangerous Food Babe’s advice can be. She is a true warrior for the advancement of science. Is there anyone else who should be a member of The Champions for Education Science? Let me know in the comments below. Originally, I was going to call this the Justice League of Science, but I don’t want to get into any trouble from DC Comics or Warner Bros.